Steve Ruwe; Maria Pallante; Board Members Dan Ekback, Ted Goldthorpe, and Jill Napier. The Copyright Society of the South, in partnership with the Nashville chapter of AIMP, recently held an event with the U.S. Register of Copyrights, The Honorable Maria Pallante, at The First Amendment Center. Pallante discussed several court cases on copyright and technology, the proposed Next Great Copyright Act, and briefed the crowd on legislative updates. Pallante is the 12th Register of Copyrights and director of the United States Copyright Office, effective June 1, 2011. She served as the Acting Register for five months, following the retirement of Marybeth Peters on December 31, 2010. Pallante has had wide-ranging experience in copyright transactions, policy and litigation, in both the government and private sectors. 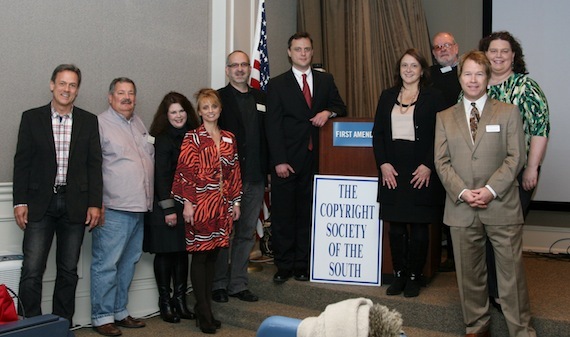 The Copyright Society of the South was formed in 1988, in Nashville by music publishers, attorneys, business people and others interested in copyright law. It provides a forum for study and discussion of domestic and international copyright law and other matters pertaining to the entertainment industry.